Sometimes a train trip is more than transportation from Point A to Point B. 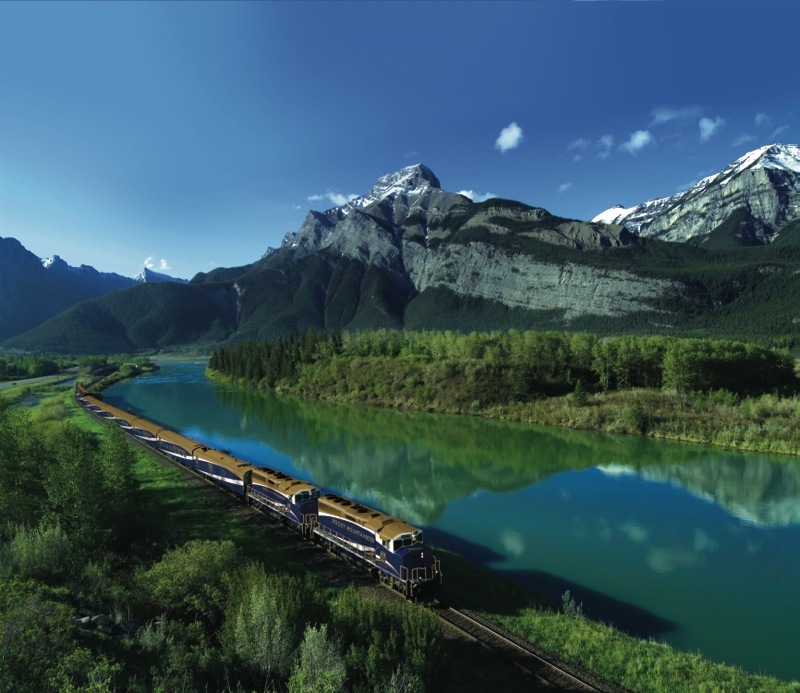 My journey from Banff to Vancouver on the Rocky Mountaineer’s westbound route was be a sublime 594-mile traverse – all in daylight – across Canada’s majestic Rocky Mountains. Prior to the train adventure, I stayed, as many passengers do, at the baronial Fairmont Banff Springs Hotel, known as “The Castle in the Rockies.” The hotel was built in a spectacular Rocky Mountain setting between the spring of 1887 and the spring of 1888 by the Canadian Pacific Railway. Over the years, it has been expanded, altered and variously improved; it is now a property that cossets its guests and delights the eye. 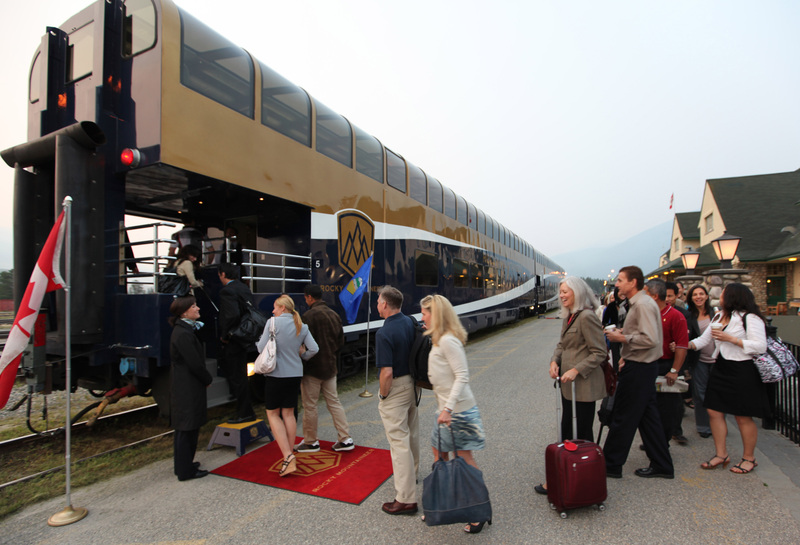 Red carpet boarding on the Rocky Mountaineer. I would enjoy the luxury of the Mountaineer’s GoldLeaf service, the equivalent of first class on a plane, traveling in a glass-domed car with 360-degree views, relaxing in an oversize seat that reclined and rotated and being pampered by unfailingly cheerful attendants. 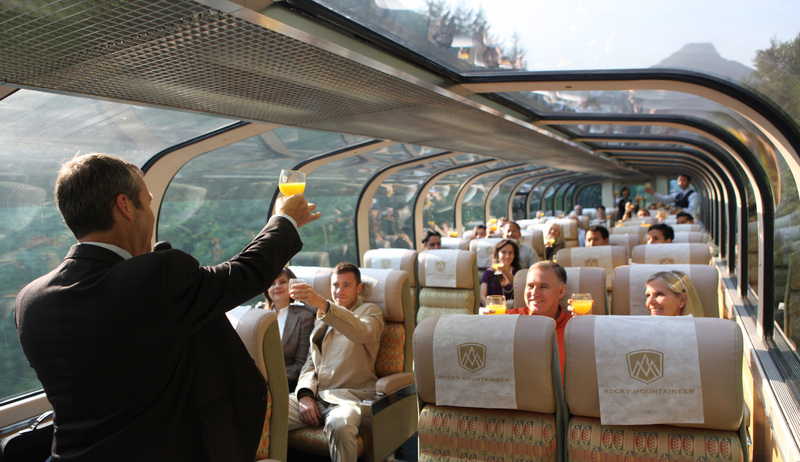 Guests are welcomed to GoldLeaf service with a toast. Beverages and snacks were served as a prelude to breakfast downstairs in the dining car. 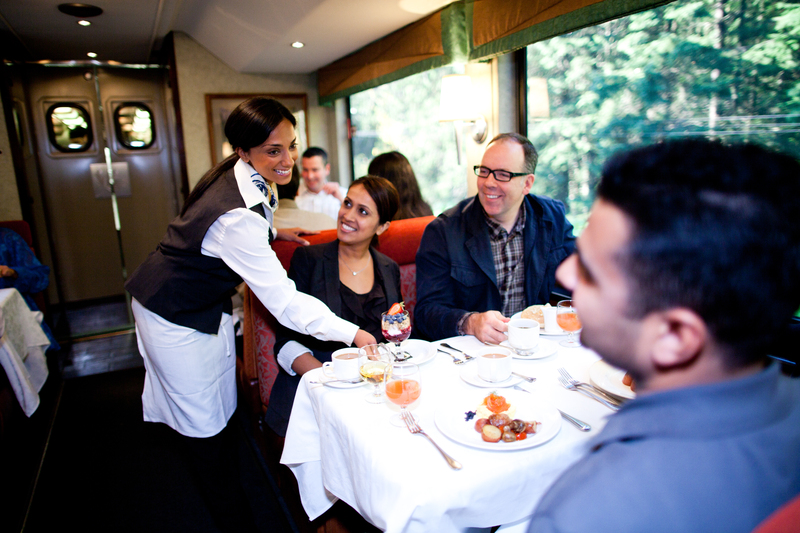 Unlike the micro-waved fare and bad coffee served on other trains, meals for GoldLeaf guests are actually cooked in a real (galley) kitchen – and the coffee is freshly brewed. Breakfast choices, served with fresh fruit, juices and baked goods, included a cheese omelet; scrambled eggs with smoked steelhead salmon, kelp caviar and chive crème fraiche; eggs benedict with Montréal smoked meat and tarragon hollandaise; buttermilk pancakes and a granola parfait. After a thoroughly satisfying meal, I positioned myself in the viewing area on the dining level, which provided a good spot for serious picture-taking, first of imposing Castle Mountain and later of the log-cabin-style train station at Lake Louise. The station, we were told, appeared in the film, Dr. Zhivago. Service in the dining room is cheerful and attentive. The Continental Divide, the highest point on the trip (5,332 feet above sea level) called for more photos of the small monument and wooden sign marking the boundary between Alberta and British Columbia. This was also the signal to put my watch back an hour, as BC is an hour behind Alberta. This itinerary is overwhelmingly scenic, and my iPhone camera got little rest as I tried to capture photos of glacier-fed lakes, rushing rivers, verdant forests and jagged peaks of majestic mountains. I had hoped for some shots of the (sort-of) promised bears – and I was too slow to catch bald eagles and ospreys in flight. But, after all, a journey like this should be lived in the moment and not only through the lens of a camera. Back in the GoldLeaf car, the attendants were serving up route information with generous interludes of quizzes, jokes and cruise-director-type patter. Since cocktails and wine were also generously served, passengers were inclined to appreciate both travelogue and patter. Verdant forests and majestic mountains offer picture postcard views from the train. We were alerted when we were about to reach the two famous Spiral Tunnels, which were built in 1907. After the train passed Wapta Lake, it entered the first of the tunnels and actually executed a spiral, then emerged down the mountainside, facing the opposite way. Later, the train descended into the Lower Spiral Tunnel and traveled even further downward. Wacky as this part of the route seems, the tunnels replaced the steep and very dangerous “Big Hill” and were considered a marvel of engineering at the time. Traveling through Kicking Horse Canyon, we followed the Kicking Horse River for long miles, passing scenic bridges and tunnels. The landscape shifted as we approached the Columbia River and traveled through the pine-rich valley known as the Rocky Mountain Trench. Lunch provided another relaxing interlude in the dining car, where smiling servers offered wine (including Rocky Mountaineer’s own label Sumoc Ridge merlot) beer and soft drinks along with a meal of soup or salad and a choice of entrées: Wild BC Sockeye Salmon; Alberta Pork Tenderloin; Wild Mushroom Crusted Chicken Breast; Braised Alberta Beef Short Ribs; Northwest Spot Prawn Bouillabaise. Desserts featured chocolate, ice cream and baked treats with coffee or tea. 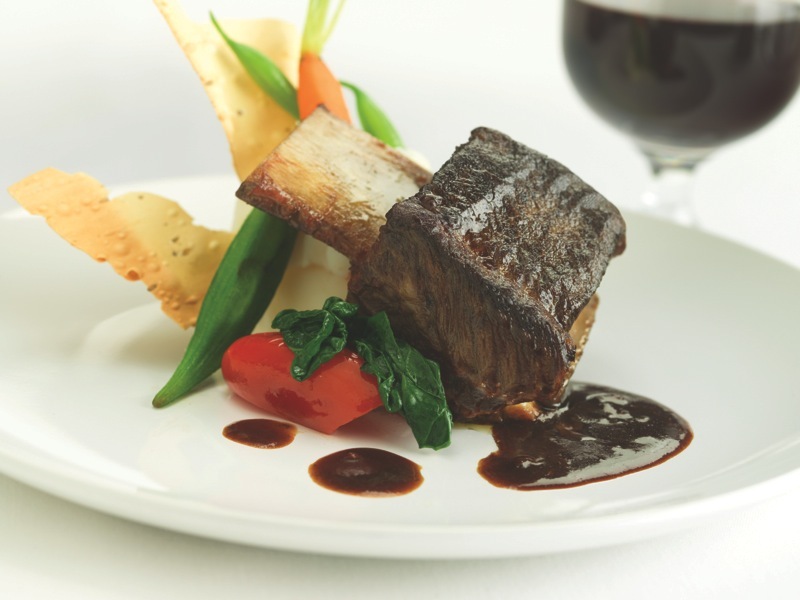 Braised Alberta Beef Short Ribs are a signature lunch dish aboard the train. We arrived in Kamloops after traveling 309 miles and were transported to a modest but comfortable hotel. Though an option for food and entertainment was available, most of us chose showers and sleep. Early the following morning, motor coaches transferred us (luggage traveled separately) back to the train, where breakfast awaited. Soon after departure, the Mountaineer traveled into First Nation territory, and our attendants pointed out a small church that was said to be used in Clint Eastwood’s film, The Unforgiven. A bald eagle alert was sounded near Kamloops Lake, and once again, cameras came out. Soon the landscape turned arid and inhospitable as our train moved toward the black lava cliff known as “Black Canyon,” then gave way to rocky terrain and stands of pine trees. Somewhat scary was the section of track that passed under a soaring cliff wall known as “Avalanche Alley,” where, yes, we saw avalanche protection sheds, a reminder of how easily disaster could strike. The next dramatic sight came almost a couple of hours later, when we reached Hell’s Gate, so named by early explorers who likened this narrow and raging torrent of the Fraser River to the gates of Hell. According to one estimate, the water is forced through here at the rate of two million gallons a minute, more than the water flow on the Canadian side of the Niagara Falls. We traveled on, surrounded by farms scattered along a peaceful valley. 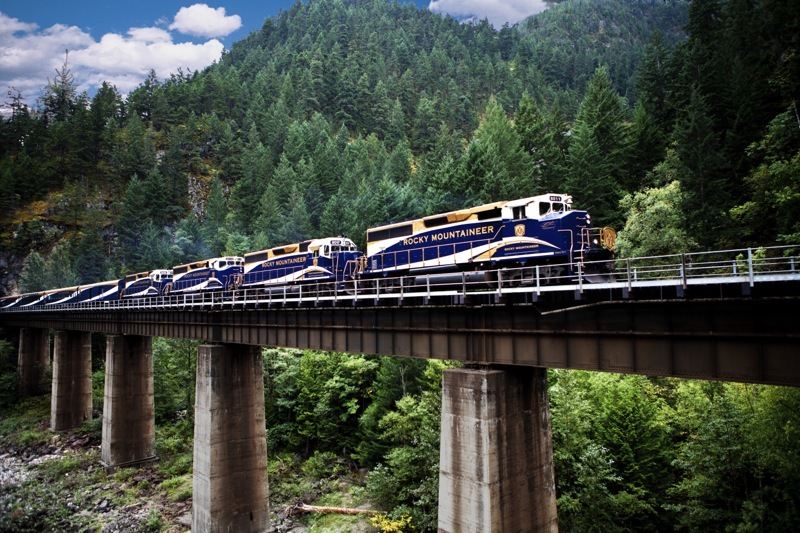 Close to Vancouver, the train slowed, crossed the Fraser River on a long steel bridge, took us through the city suburbs – and finally to the Rocky Mountaineer terminal. Our 594-mile odyssey ended amid a flurry of good-byes and thanks and hugs given and received by the train staff. 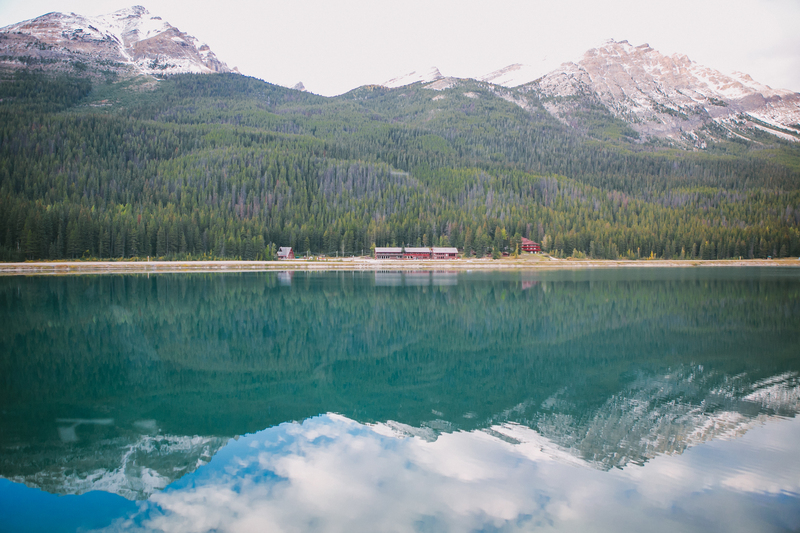 It had been a memorable experience, an opportunity to see the great Canadian Rockies in comfort and a reminder of how civilized and pleasant train travel once was – and could (wishful thinking) be again. 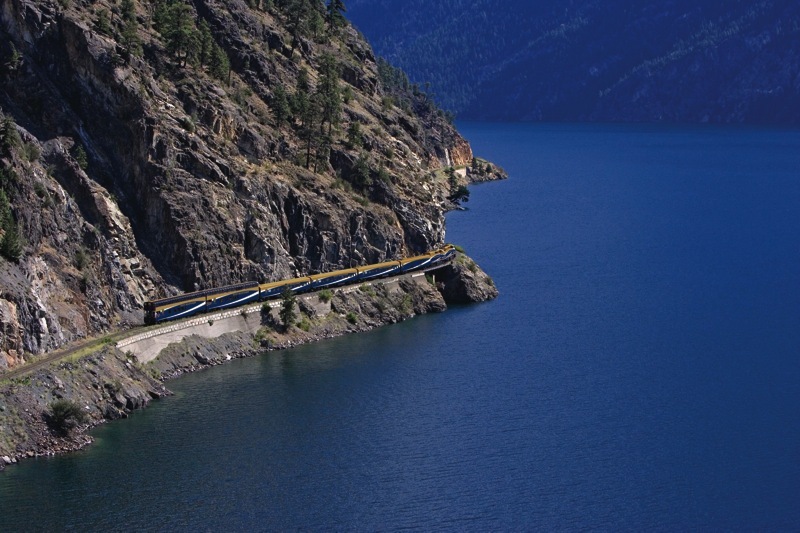 Travel Information: The Rocky Mountaineer offers regular scheduled departures along several routes between April and October. In addition to the GoldLeaf service described here, two other classes are available. SilverLeaf passengers ride in a single-level glass-domed car and are served meals (including hot entrées) at their seats. RedLeaf passengers have reclining seats in a single-level car and are served chilled breakfast and luncheon selections at their seats. An overnight journey between Banff and Vancouver costs about $2,000, GoldLeaf; $1,600, Silver; $1,100, Red. For more information, visit http://rockymountaineer.com/ or call 1-877-460-3200 (toll free USA and Canada). All images courtesy of Rocky Mountaineer. Eating Around the Kenya Bush!